No, that cannot happen. Caching is fully transparent and coherent. OK, that's a point, but the load-modify-store cycle is interruptible, and memory ordering is not guaranteed across cores because the execution order can vary. Not sure whether this alone could already explain the observations. That sound like a bug in the PRNG. No, rand() is specified as not reentrant and not thread safe. So what actually happens with multithreaded use will always depend on the libc in question. It's even legal to have the state per thread and not global. Well, the results do appear to show that python random.randint() does perform differently. I wonder why/how. Basically the calling process is forked n times (in your case 8 = number of "cores"). How fork works wrt memory: copies virtual address space of parent process (pages point to the same mapped pages as in parent process), then marks pages to trap on write access and then creates a local copy on demand in the handler, so basically "copy on write". What happens: rand() has a global state in C, so n forks happen, "copying" the parent global state. In C one would use threads so they would happily race on the global state and still produce pseudo-random numbers. As for rand(), I would recommend to stay away from it. It's fine when you use a good standard library (gcc, ...) but Microsoft stdlib implements this as a dumb LCG (which is anything but pseudo-random) PLUS the return value is masked so that only 15 lsbits are kept => disastrous. No, makes no difference. See results below. xorshift() with a seed for each thread is good though. but Microsoft stdlib implements this as a dumb LCG (which is anything but pseudo-random) PLUS the return value is masked so that only 15 lsbits are kept => disastrous. The reason for the masking is that otherwise, no numbers will repeat throughout the whole period of (in this example) 2^31. Therefore, anything somehow related to the birthday paradoxon would fail. Also, any application that just wants a random yes/no and tests that for checking the LSB of the output would yield an alternating 0/1 sequence. The TYPE_0 implementation in glibc has these problems. An LGC has the main advantage of being fast to compute, and I don't see what would be "disastrous" unless used for some cryptographic purpose where rand() should never be used at all. For initialising some engine weights, it's perfectly fine. This is no excuse for using a bad PRNG. Here's my old public domain PRNG that passes all dieharder tests, is blazingly fast on a 64-bit machine (providing the compiler can fold rotations I get ~ 1 billion 64-bit HQ PR integers per second), burst-free, doesn't break on zero IV, not crypto-secure of course. Internal state is 128 bits. LCG is still faster but is anything even remotely close to pseudo-random. It's actually a pile of crap. I still don't follow how masking is useful? You can always mask yourself. Also by requiring more samples from a bad PRNG to glue larger PR numbers, the quality decreases even more. LCG is a no-go for anyone who cares. It isn't "bad", it's at worst unsuited for certain applications. The one in question here simply doesn't belong to them. The issues that Chris was experiencing had nothing to do with the LGC, but with how the state is managed. Now that's bad practice because then you have to fumble out the implementation, which is not how a library is supposed to be used. Yes, I already explained the issue he was having. It isn't "bad", it's at worst unsuited for certain applications. A very long time ago, probably last century, I wanted to make a random texture for artistic purposes. 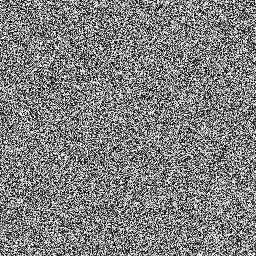 I knew that Microsoft's rand() was bad, but I thought it would be good enough just to make a random texture. The result was disastrous. Microsoft's rand() is also 'unsuited' for any serious statistcal application. Possibly Chris has a situation where it is OK.
A very long time ago, probably last century, I wanted to make a random texture for artistic purposes. 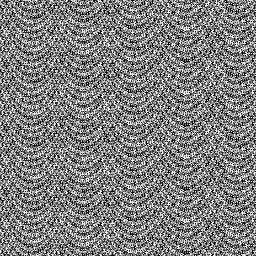 I knew that Microsoft's rand() was bad, but I thought it would be good enough just to make a random texture. The result was disastrous.